Reservations for 2019 will start April 16, 2019. Get the spot you want by reserving. We are expecting a busy season! We hope to see you soon! 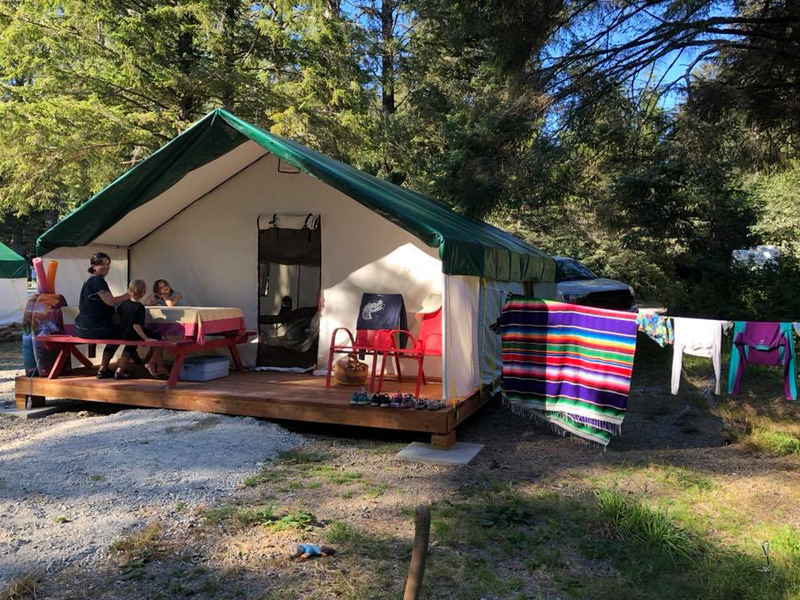 Pachena Bay Campground is now pleased to offer wall tents. These tents are 16ft x 20ft and sit on a wood platform. There are 4 wall tents available to rent on a nightly basis. The cost is $119 per night, which includes 4 cots, a table, firepit and woodstove inside to keep you and your belongings warm and dry. For information on off-season rates and availability please email us anytime at Info@PachenaBayCampground.ca. Pachena Bay Campground is nestled in an old-growth rainforest next to an expansive, sandy beach that directly faces the open Pacific Ocean. The campground has been smartly upgraded to welcome RVs and campers as well as tenting. The campground is at the mouth of the Pachena River next to the Huu-ay-aht First Nations community of Anacla. Pachena Bay is at the head of the world-famous West Coast Trail and is 5 kms from Bamfield, BC on Vancouver Island’s unspoiled west coast.